Careful! This new game is really addicting! Defender the new tablet optimized game from the developer Droidhen, has a bunch of games out like Fishing Diary, Shoot the Apple and Miracle City Online which are all free and available in the Android Market. Defender is a shooting game. You’re the Defender and have a bow and three super weapons to protect and defend your castle from monsters and bosses. Your strength, shooting rate, bow, super weapons, life- and mana-points plus much more, are all upgradeable with money or mana points you either collect or buy within the app. 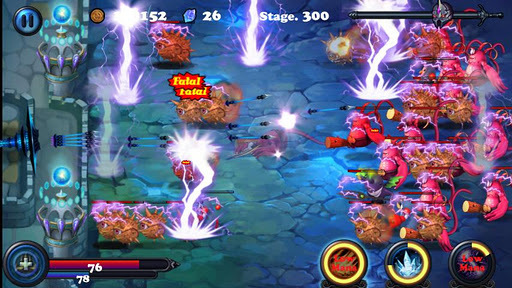 In this game you will be firing, freezing and lightening your enemies to death. Check it out! It’s free, fun and actually pretty addicting. See full description, video and download link after the break. Waves of monsters are attacking your castle. They move fast, strike hard, and never give up. It’s time to equip your BOW to fight! Can defend your castle against intruders with your archery?